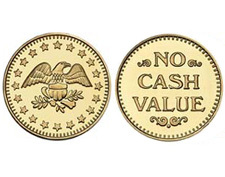 Tokens, direct from the factory at factory-direct prices. 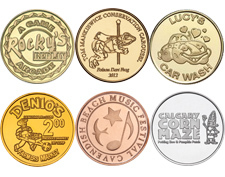 We provide tokens of great quality and design, quickly and easily, to video game operations, batting cages, parking facilities, car washes, laundromats, FECs, amusement parks, bar arcades and toy vending machine operators. With multiple blanking lines and coining presses running daily, we turn out as many as 600,000,000 tokens a year. That quick turnaround helps avoid expensive express freight charges. Stock tokens ship in 1-2 business days, custom tokens in 5-10 days. 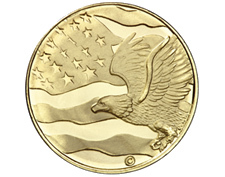 Token metals include aluminum, brass, red brass, nickel silver and copper plated zinc. Sizes range from 0.800” to 1.250”. 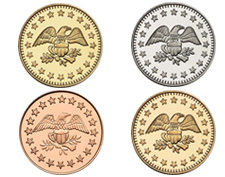 All tokens are Made in the USA from US sourced metal. Various metals ranging in size from 0.800" to 1.250". Order stock tokens that ship in 1-2 business days. Proudly made in Cincinnati, Ohio since 1835.